As the wind rose from the ocean, he vowed to forgive and forget all the mean people who had poked fun at him, who had made him feel less than he was, those who had branded him as a misfit. He had already left behind his small family. His mother had died in childbirth. His uncle and aunt were rather relieved to see him go. There he stood then, under the oak tree, murmuring incantations to the elements, even before he knew he was destined to become the greatest magician of all times. What was his calling? Who was calling him? He did not know, except for a fierce longing to follow his own wild heart. The morning was grey and restless, beneath the shimmer of silence, like a surface hiding an unexpected depth. On the threshold of time, while he was hanging in a calm limbo, Merlin caught sight of a little robin hopping among the branches of the oak tree. 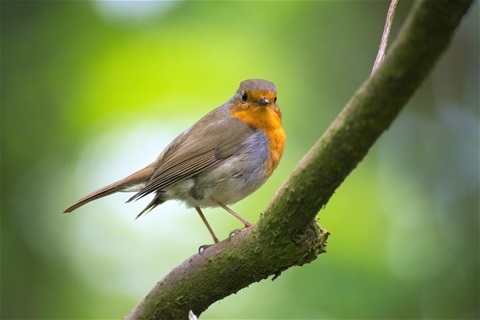 He spotted its red breast for a moment, then it hid among the leaves. Yet, Merlin could sense its presence in the rustling of leaves. He was intent on listening. For a stretch of time, Merlin was there, sensing the little winged sprite. Little by little, his senses opened up like a flower. He felt the bird's blood circling in its tiny body, the flutter of his wings. Merlin closed his eyes. He saw the bird clearly. He waited. He listened to the bird's song, a strange, melancholic chirping in the thick of the branches.